I'm always excited to teach others the hidden beauty in watercolor and we’ve been up to a lot. Check out past events that we have done and be sure to stay tuned on our Upcoming Events page for new things happening! When: February 23-28, 2018 from 10:00am - 5:00pm each day, except Friday the 23rd which is 10:00am - 9:00pm. Where: KSA Gallery in Lihue at the Kukui Grove Shopping Center. Details: Helen Turner and I will are having a fine art sale! We will have special prices on our work including Kauai originals. We will also be making a drawing for an original art piece daily! Helen is a pastel and oil artist and, as you know, I'm a watercolor artist. So there will be a lot of beautiful pieces to enjoy! We invite you to come out to view and purchase our paintings! When: February 2 - 4, 2018 from 9:30am - 3:30pm each day. Cost: $225 - Includes all three days! Details: We will be learning about shapes of flowers, and quick ways to draw the 8 individual shapes. You will also learn about different design ideas to make those flowers stand out! We are on the Garden Island, what could be more appropriate than painting flowers! Details: Have the perfect painting vacation! Lanesboro is labeled the “Art Town” and is filled with quaint shops, fun food, We LOVED the feel of our accommodations, including our own little lunch room and classroom. There are a few rooms reserved for participants, but you can attend as a day student, if you live in the vicinity. We all brought food to pass, so we had crock pots and coolers to help with expenses. Cost: $225 ($50 deposit to hold your spot) - This includes all three days! Details: This class we will be painting the scenery of Kauai. We will be doing fishing scenes, Rainbow Eucalyptus trees, or a waterfall, and people on the beach. The inspiration will be all around us. We'll take our photos and paint indoors. When: February 5 & 6, 2018 from 9:30am - 3:30pm each day. Cost: $150 - Includes both days! Details: This will be a 2-day class on painting more complex floral creations, larger in size and differenet technqiues. 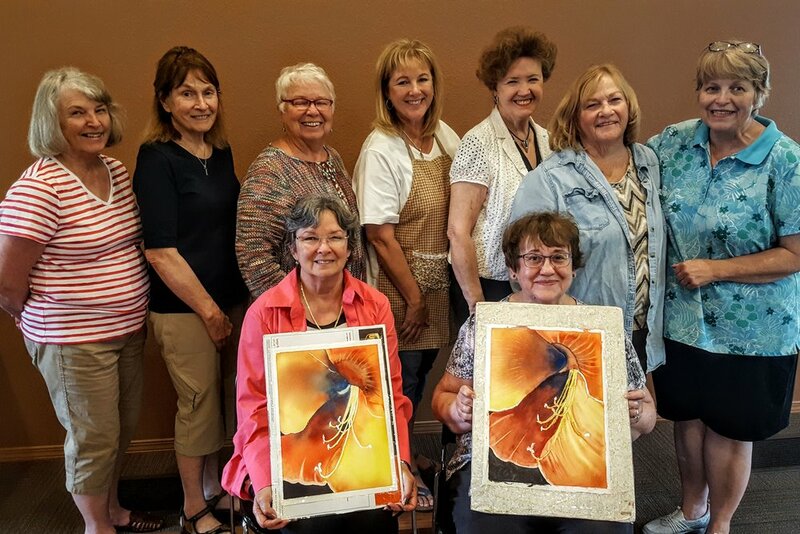 Details: Come view the artwork of Kathy Kovala, Watercolor Artist, and her students at the Minnesota Conservatory for the Arts ( Valencia Center) at 1164 West Howard St. These students are from the Winona area, including Lewiston and Utica. The paintings are a result of 1 to 4 years of learning and include a wide variety of subjects, abilities and techniques - including how to frame, mat and hang their artwork for exhibition. Some pieces will be for sale by contacting the artist. Details: There will be two exhibitors at the exhibition, Kathy Kovala and Cynthia Kath Fine Art. What: Learn to paint Barns, Farms, Farmers & Produce. When: October 27, 28 & 29 | Painting from 9:30am - 3:30pm with half hr lunch. Details: Have yourself a mini vacation, paint, paint, paint, and forget about the daily chores. Come and experience a fun workshop with a subject true to Minnesota's legacy of farming! Class fee is $250 for three days, and you can drive in daily or stay at the Cottage House Inn in Lanesboro, 507-467-2577 (call Lynn and ask for the reduced rate for painters! Rooms are the same price for twin beds or one bed!) To register call Kathy at (715) 360-9929 or email kathykovalawatercolor@gmail.com, a $50 deposit is appreciated! There are rooms reserved for our group, and we can leave our paints in the classroom. If you would like to eat meals in the classroom there are plugs for crock pots and refrigeration. Lanesboro will be beautiful at that time of the year, lots of colorful leaves and there is a community theatre with performances across the street. Share a room with a buddy and it's around $35 per night! Supply sheets available upon registration! Class starts on Friday, Saturday and Sunday from 9:30am until 3:30pm. Get your spot now! What: Hands on watercolor class. When: Kathy is away in Hawaii for the winter, but we'll resume in April 2018! Details: Join me for a hands on watercolor class where we all learn and improve together! Be inspired by the color and let the water do the work. Beginners are welcome! showing you examples of the principles and then allow you to adapt them to your creations. Students will say things like this “I had this in college, but I never made sense of it until now!” “I went to Arizona for the winter and used it in my stained glass class, I formed my colors by using design principles and it worked!” One student took the class and went back and brought 16 of her painting group for a special session. This workshop is sponsored by the LCSAC – LaCrosse Society of Arts and Crafts – it will be held at the Day’s Inn on French Island. Contact is Penny Stroening - pstroening@yahoo.com for additional details!